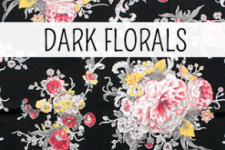 Don’t fooled into thinking that florals are only for springtime – dark florals have been popular this summer and that trend is perfect for carrying through to autumn and winter. Carry the darker tones through your whole outfit to make the florals really pop. Weekend brunch calls for a loose comfortable shirt in a soft floral print, skinny jeans and a great pair of ankle boots. Keep your accessories simple – I’d go for a set of gold bracelets and a blush toned bowler bag. This floral dress is perfect for both the office and for heading out to dinner – during the day, pair it with a hobo bag and court shoes, and then at night go for a wedge heel and a clutch. I really love the print on this dress, and was very pleased to find that it’s also available in a scoop neck tee (which would be great with a pencil skirt). In the weekend I like to wear clothes that are slouchy and comfortable, but are still stylish. A pair of printed pants with a tee and a slouchy cocoon cardi is just perfect for anything from heading to brunch, walking around the local farmers market, or doing a spot of window shopping. Embrace this season’s beautiful blush tones with a look for the office that is soft and ladylike while still being very much on trend. If your office is a bit more corporate, switch out the cardi for a blazer. How will you be wearing florals this autumn?